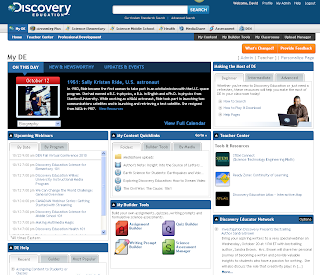 Perhaps one of the more underutilized applications available at ETHS, Discovery Education Streaming (DES) offers over 80,000 embeddable and/or stand alone video clips for teachers to use, stream, and download through the cloud. In this series of posts, I'll take a closer look at a few different ways to maximize DES in your classes. Today's first post involves some general features of DES and how you can immediately get up and running. If you want to use video clips as openers, this module is for you. 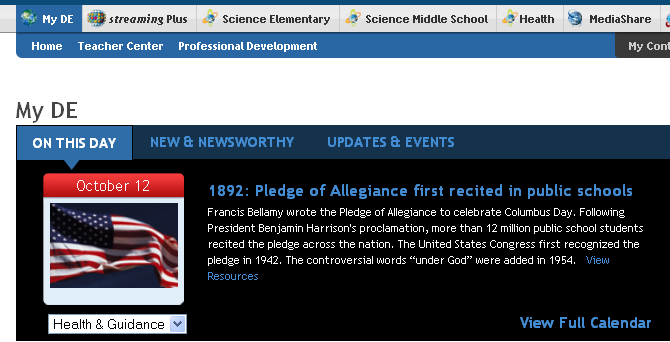 You can choose an "On This Day" video from a variety of subject areas found in the dropdown (arts/humanities, biography, health/guidance, language arts, math, and science). The new and newsworthy might offer some timely resources, and updates/events give you some DES specific content. Similar to how I would structure a training on DES, the "Making the Most of DE" module features three levels of resources for using the application. 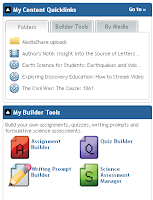 All faculty and staff can start with the Beginner's resources, and within minutes, you'll be search, streaming, and downloading videos. Intermediate users can find worksheets and related videos, as well as learn how to save content and embed into PowerPoints. 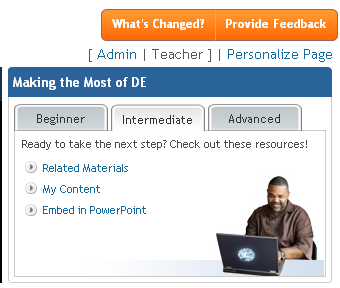 The wealth of features in DES becomes evident in the Advanced section of the training module. 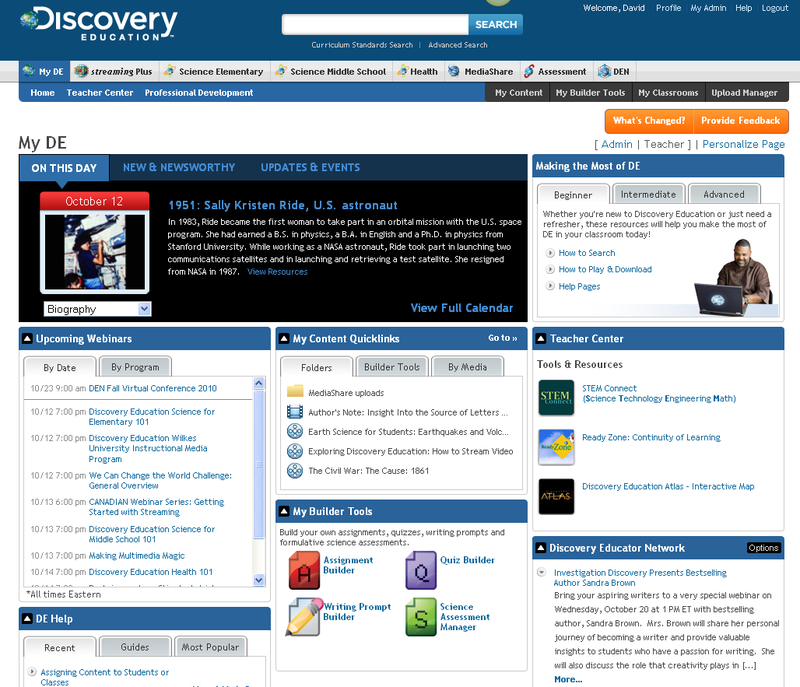 Working clockwise around the screen, we find links to other important resources, including the Discovery Education Atlas, an Interactive Map which I'll discuss more in a separate post. 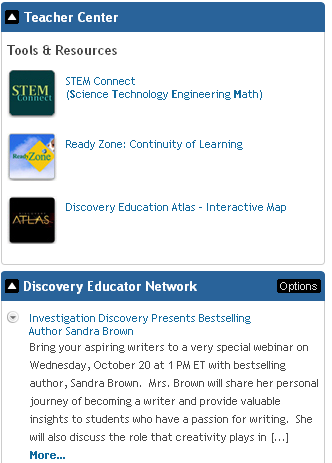 On the lower right, the Discovery Educator Network (DEN) is featured, and this is a great place for teachers to get advice from other teachers using DES, as well as an opportunity to get involved in creating content and shaping our DES experience. With the DEN, you'll also find lots of opportunities for more free resources, free training via webinars and online virtual conferences. These are all organized by date or by program, and can be quite useful if you find something that fits your training requests. DE Help provides support in the form of videos, guides, and a dedicated customer support phone and self service system. Lastly, in the center, you'll find Quicklinks for resources that you've saved to your My Content, as well as access to the My Builder Tools, which we'll cover in a separate post as well. All of this and more on your "My DE" page, which is the default home screen once you've logged in. For some flexibility, you can click on "Personalize Page" to rearrange, add, and subtract modules. In future posts, we'll take a closer look at streaming Plus and taking your DES experience to the next level. Until then, I encourage teachers to explore your homepage and make it a place where you'll be able to find what you want when you want it.